O’Carolan’s achievements are even more amazing when you consider the backstory. Born in 1670 on a farm in Nobber, County Meath, at a time when Ireland was still suffering the reverberations of Oliver Cromwell’s “To Hell or Connaught” land confiscations, the family moved, first to Carrig-on-Shannon in County Leitrim, and then, in 1684, to Ballyfarnon, a village in what is now Northern Roscommon. His father, Hugh, found employment on the estate of the McDermott Roes, a leading Irish family of the old Gaelic order who, despite being Catholic, had managed to retain substantial landholding. The lady of the house, Mary McDermott Roe, took a liking to 14-year-old Turlough, and saw to it that he got some schooling. He proved himself adept at poetry and verse, yet any dreams he may have had of scholarly pursuits were not to be. The plan was that he would follow his father into the blacksmithing trade but fate intervened. At 18, O’Carolan was stricken with smallpox and nearly died. He survived, but the disease left him permanently blind. Again, Mrs. McDermott Roe rose to the occasion, arranging for Turlough to have lessons on the harp. In those days, music was often the only possible livelihood for the blind. It was learned by repetition and transmitted from teacher to student orally. Also, for centuries, the harper, like the poets enjoyed an elevated social position in Ireland, and were welcomed in the houses of wealthy landowners, in exchange for compositions and verse that praised their hosts. The harp was a symbol of Irish nationalism, and harpists were often the political commentators of the day, feared for their satirical verses. So much so, that during Cromwell’s invasion of Ireland, harpists were hunted down and killed, their instruments destroyed.By 1691, the courts of Irish chieftains who had once patronized the harpists were long gone. Nonetheless, there were still, in the late 17th and early 18th centuries, enough Irish families with the means to support O’Carolan in his travels as an itinerant musician. There were also the more recently arrived Protestant gentry who, curious about the ancient folk culture of the land they dominated, welcomed O’Carolan into their homes as a living vestige of Gaelic Ireland. O’Carolan’s first stop on his journey away from the McDermott Roe estate was at the landed property of Squire George Reynolds. Legend has it that the squire, who was himself a harpist and a poet, did not think much of the young harpist’s talent. “You might make a better hand of your tongue than of your fingers,” the Squire is reputed to have said. He suggested that O’Carolan compose a tune about a legendary battle between the fairies that took place in the nearby hills. 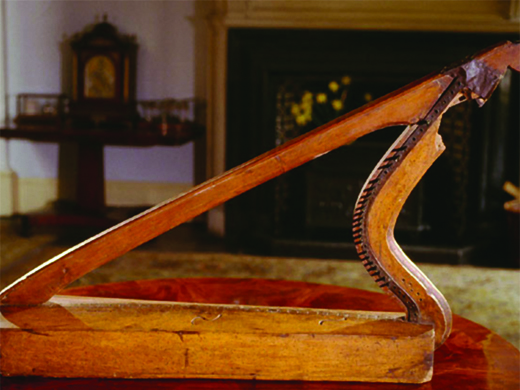 O’Carolan complied and his “Sheebeg” is still played today. O’Carolan had found a niche. He would match the music he played and wrote to the taste of his hosts. He might play traditional Gaelic airs for one patron, and an Italian-influenced melody for another. He typically came up with the tune first, riding on horseback while composing. He then added words to the melody. Often his tunes were joyful “planxties” – a word that he is said to have invented. They were akin to jigs for the harp. 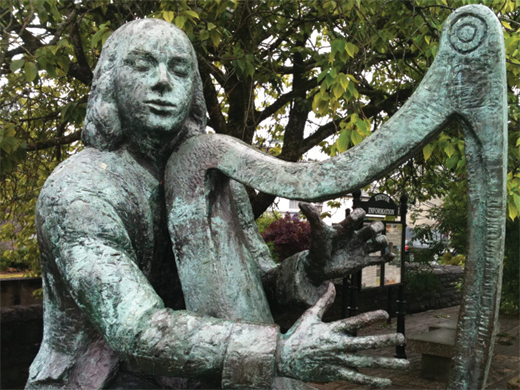 The blind bard toured Ireland for more than four decades. As his fame spread weddings, even funerals, were sometimes delayed until he arrived to perform. Unlike many tormented musical geniuses who lived on the fringes, O’Carolan’s music gained him entrée into the most elite circles of Irish society. He dined at the tables of lords, high churchmen and university professors. At the homes of the elite, O’Carolan discovered the Italian Baroque style of Corelli, Vivaldi, and Geminiani, whom he greatly admired. He began incorporating Baroque elements into his own music, skillfully weaving continental rhythms into a distinctively Gaelic musical language. He incorporated Italian concerto and giga, the French menuette and gigue, the Renaissance branle and the medieval estampie, combining them with subtly irregular phrase lengths, which are a distinctive feature of his compositions. One of his patrons, perhaps the greatest Irish genius of the age, was Dean Jonathon Swift. Legend has it that O’Carolan met up with a group of Italian musicians at a party in Swift’s home and challenged the violinist and music teacher Francesco Geminiani to a test of musical skill. The Italian accepted and played from Vivaldi’s Fifth Violin Concerto. Hoping to have some fun at O’Carolan’s expense, he made deliberate mistakes. The bard was not to be fooled.“It limps and stumbles,” O’Carolan exclaimed in Irish, when Geminiani finished. He then played the same piece on his harp, without error. The amazed Italians declared him a musical genius. He followed this with the first performance of “Mrs. Powers,” known now as “O’Carolan’s Concerto.” A marriage of the Irish tradition with the Baroque, the concerto was said to be a favorite of all his compositions. He fashioned it in honor of Elizabeth Keating, a patron, who became Mrs. Power of Coorheen, County Galway. O’Carolan’s first great love was a girl who lived near his birthplace in Nobber, County Meath. As a boy, he attended a school that was run by a wealthy landowning family and fell in love with the daughter of the house, Bridget Cruise. Bridget’s parents would never have allowed a romance between their daughter and a peasant like O’Carolan to blossom. And in any case, Turlough’s family were uprooted when he was 14 and he left Nobber. Still, his affection for Bridget remained lifelong, and he composed four airs in her honor. Legend has it that after many years had passed, the blind bard went on a pilgrimage to St. Patrick’s purgatory in Lough Derg, County Donegal. Returning to the shore, O’Carolan began assisting his fellow pilgrims out of the boat. Upon taking the hand one woman, he is said to have exclaimed in a loud voice, “This is the hand of Bridget Cruise,” and it was. O’Carolan did marry, but not to Bridget. He married Mary Maguire, who is said to have been from County Fermanagh, and of higher birth than the harpist. There is some disagreement about the year of their marriage; some records state it was in 1720 when O’Carolan was 50 years old, others say he married younger. The couple had seven children, six girls and a boy. They lived on a farm in Mohill, County Leitrim until Mary’s death in 1733. O Lady who succored me at every stage. Alas, that I am not buried along with Turlough! With the world’s music to be with one for company. O’Carolan left some two hundred tunes. Most of his compositions were not published or even written down in his lifetime. They survived in the repertoires of fiddlers, pipers, and the last of the old Irish harper/singers. They were collected and published during the late 18th century and beyond, largely beginning with the work of Edward Bunting and his assistants in 1792. For many years, though his music was not widely known, even in Ireland. In 1967, Seán O’Riada helped revive the music of O’Carolan with his solo recordings and his recordings with Ceoltóirí Chualann of O’Carolan’s Concerto, which was recorded on the disc Ceol na Nuasal. 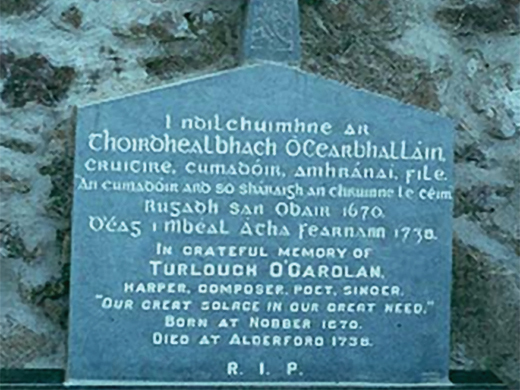 Much of the popularity of O’Carolan’s music is thanks to Derek Bell of the Chieftains who helped present it to a worldwide audience. The annual O’Carolan Harp Festival and Summer School commemorates his life and work in Keadue, County Roscommon.